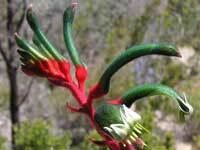 The Red and Green Kangaroo Paw (Anigozanthos manglesii) was proclaimed the floral emblem of Western Australia in 1960. 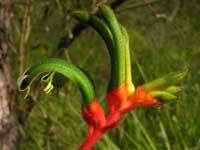 It is also called the Mangles Kangaroo Paw after the English botanist Robert Mangles who cultivated it in England. 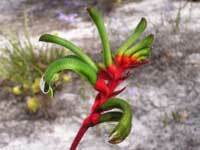 It is only found in the south west of Western Australia - from Shark Bay south to Albany. 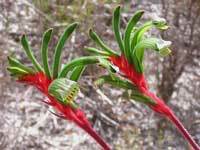 Its red flowering stems are a metre high and it flowers in spring. The species is protected and can not be picked in the wild. 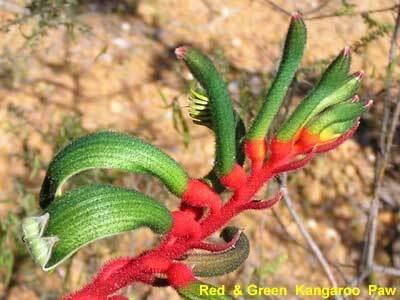 According to the Australian National Botanic Gardens there are about a dozen species in the Anigozanthos genus. 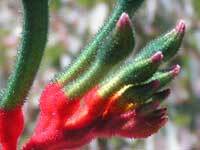 The Western Australian Flora Database describes 9 Kangaroo Paws including the Black Kangaroo Paw - see below - which belongs to a different genus. In our search for Western Australian Wildflowers, we were advised in Northam (100km north-east of Perth) that if we wanted to see wildflowers we would have to drive 3 hours north. A little crest-fallen but also incredulous, we drove 27km to Toodyay (pronounced 2-J). At the Visitor Centre (and Ye Olde Lolly Shoppe), Susan gave us a map of the local area, and within minutes we had found our first "wild" Kangaroo Paw. The image to the left and the two above are all from the Toodyay area. 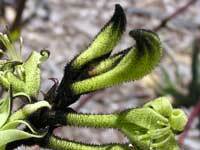 Although related, the Black Kangaroo Paw (Macropidia fuliginosa) is the only member of its genus. It grows from Perth north to Geraldton. 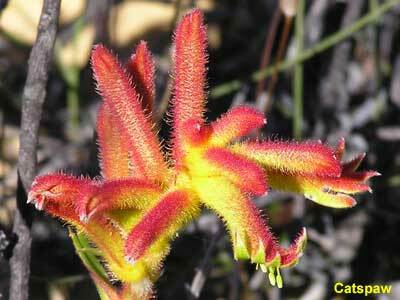 The Catspaw or Cat's Paw (Anigozanthos humilis) is found in south-west Western Australia in an arc from north of Geraldton to east of Albany. 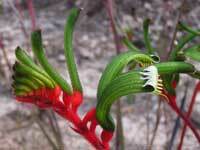 Also see the Western Australian Banksias and Orchids. 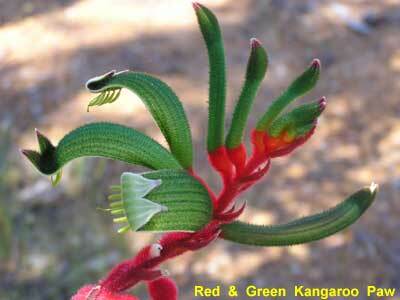 The following images of Red and Green Kangaroo Paws below were too spectacular to be omitted. Also taken at Toodyay - I think we nearly wore out the camera. This and the next image was taken north of Margaret River. 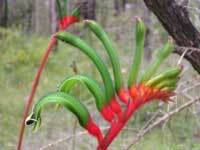 All the Red and Green Kangaroo Paws were found on the side of the road. These three images were taken north of Augusta. On our travels we felt that the wildflowers were being swept away by "progress". One can now only imagine what the wheatbelt was like before wheat.